When I visit my parents at their Winterberry Farm in western Massachusetts in March, I search out the woodland seeps behind the house. It is there that I find one of my favorite early spring emergents: skunk cabbage. Despite its name, it is a beautiful plant in form and color. The flowers emerge protected by the hood, which is a modified leaf called the spathe. The hood comes in shades of maroon and green and is often speckled, and carefully protects the flower that remains mostly hidden inside. The skunk-like smell of the flower attracts small flies and beetles at a time when the surrounding trees and shrubs are still leafless. Skunk cabbage is avoided by most mammals. Bears apparently seek it out when they emerge in spring from hibernation. 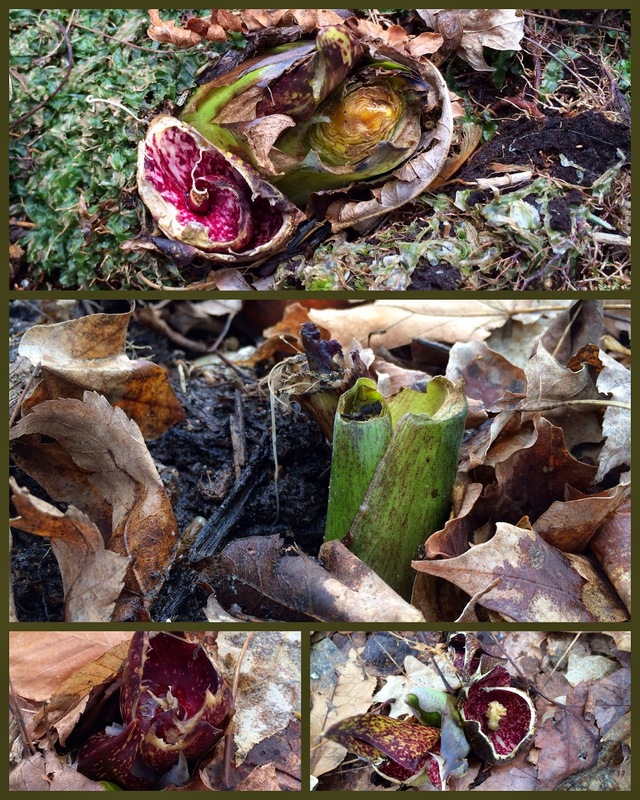 On my skunk cabbage excursion yesterday I noticed that many of the plants were chewed. I considered squirrels, rabbits, or turkeys as the possible nibblers. 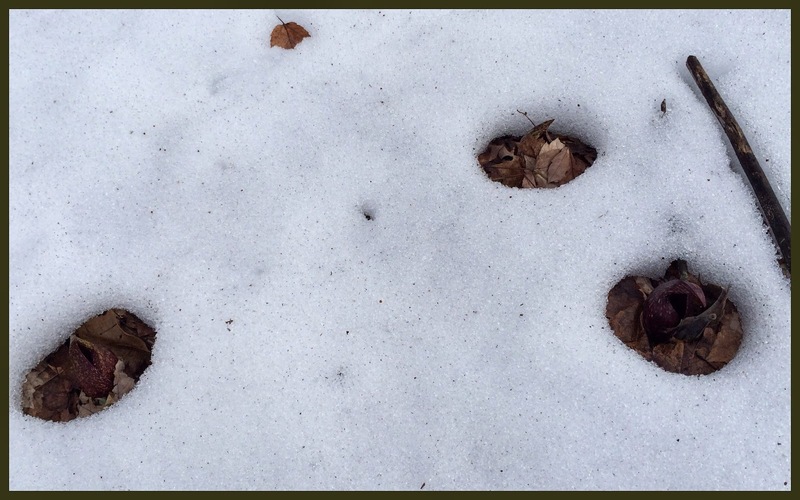 All three are common here and signs of their tracks were evident in the snow. I decided it was turkeys that had pecked at these cabbages, but maybe it was one of the others. 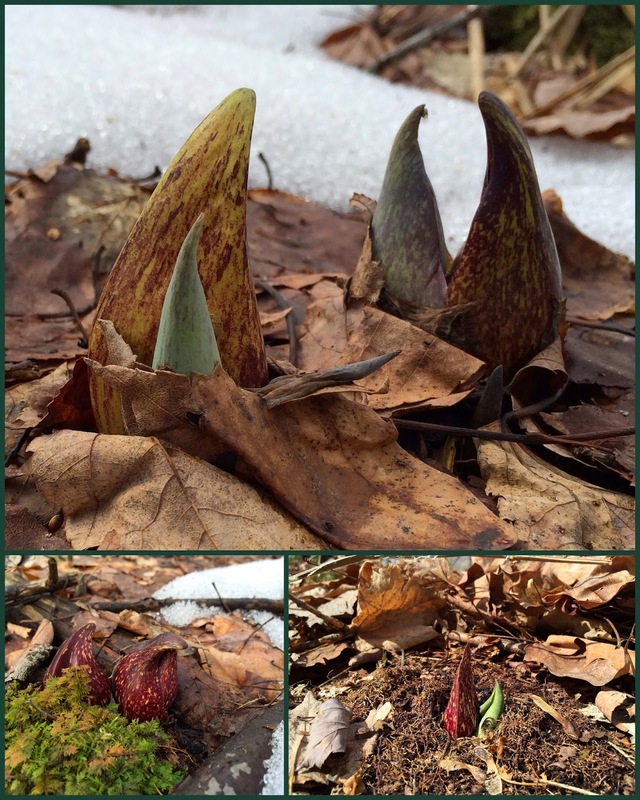 Skunk cabbage flowers and their protective hood emerge when the ground is still snow-covered. The flowers generate excessive heat during respiration, which melts the snow around them---as you can see in the photos below. Soon, the spear-like tightly packed buds of leaves will emerge next to the hoods. 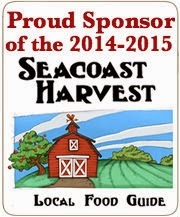 In another month the leaves will unfold, turning the brown-colored seep into a sea of green. Until then, I'll enjoy seeing the multi-colored hoods poke through snow and leaf litter as spring slowly unfolds this year. The past two weeks rolled by with just the slightest hint of a transition from winter to spring. The outdoors stayed cold and snow-covered. We had brief spurts of interesting wildlife sightings: skunk tracks in snow, a small flock of cobalt-blue bluebirds at the suet feeder, a dozen turkeys. Red-winged blackbirds returned. I looked hard for signs of spring. This morning I heard the most hopeful sign yet: a male woodcock peenting before dawn from the edge of a still snow-covered field. In keeping with this year's weather their arrival is a week later than usual. Even the cardinals sounded more spirited this morning. The only bit of fresh green that I could find in my yard on these first few days of spring was the moss growing on our rock wall. At least it is something as another week of cold temps and wintry weather is in the air. Kodi and Henna are the only 2 in our family of 4 that are still loving all the snow that remains in our yard. Meanwhile, I was relishing the sound of snow and ice melting from our roof and thankful for a second day of blue sky and full sun. Okay, despite the fact that it was zero degrees this morning at 6:30 am AND that the National Weather Service in Gray, Maine says...."One last day of arctic chill.....followed by a brief warm-up for NH/ME!" (Did you get that part about brief? ), it was a beautiful winter day today. The hardwood trees looked lovely bathed in full sun and back lit by a blue sky. Titmice were singing from the treetops. The overnight dusting of snow quickly melted away from the roads. The sun felt so good on my face during a mid-day walk with Henna and Kodi. We spring forward on Sunday, Mother Nature ready or not. We spent the weekend at a friend's rustic cabin off Bear Notch Road. Once the wood stove gets cranking in the cabin kitchen the place (at least that room) warms up nicely. A good thing, since at 5:00 am Saturday the outdoor thermometer read -20F. On Sunday, the 5 am temperature was +20F, a nice wide swing in the right direction. But this is March, it has got to start warming up sometime. On this winter excursion we took a different approach to hiking. Rather than climb a peak or two, we opted for low elevation and relatively flat ground. 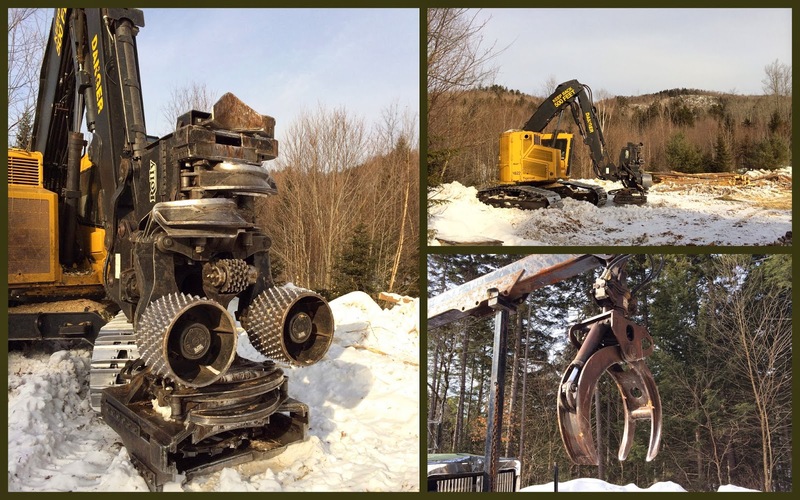 The White Mountain National Forest has a forestry operation underway (known as the Northeast Swift Integrated Resource Management Project) along FR 209, which extends easterly about 2 miles from Bear Notch Road. The plowed forest road was gated and on the weekend the loggers were not working, so we had the road and surroundings to ourselves along with our dogs Kodi and Henna. On Saturday we hiked FR209 to the very end where a large landing was piled high with logs. Since the loggers were home resting for the weekend, we got to explore their operations: we looked in awe at the large bulky, rugged equipment; studied the piles of logs sorted by tree species, and appreciated the hard work of getting wood from snowbound woods, to log landing, to truck, to a mill. 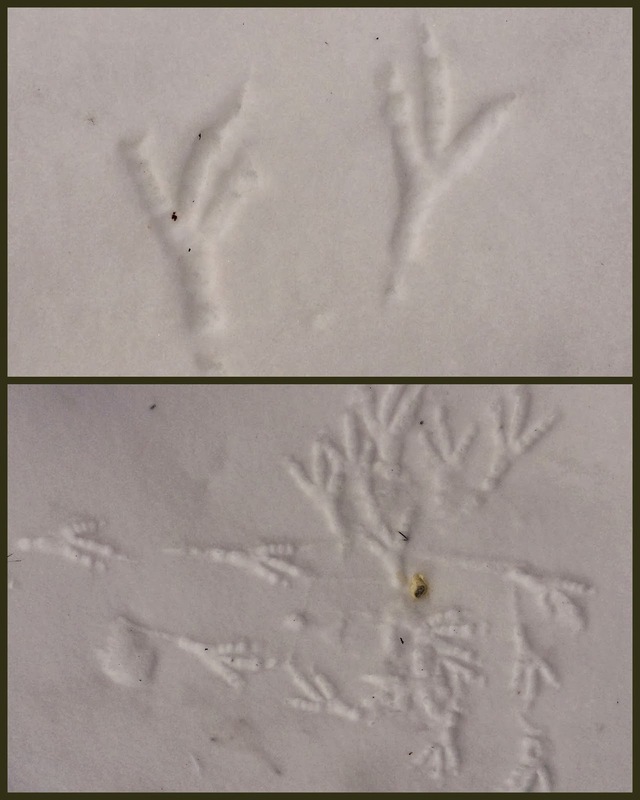 The wide, quiet road was lined and crisscrossed with dozens of animal tracks--snowshoe hare, fisher, weasel, mice, coyote, and a big bird.....This is the best snow print of a bird and its tracks in snow that I've ever seen. Maybe a raven? The Nanamocomuck Trail meanders for miles along the north side of the Swift River (and the Kancamagus Highway). We hiked a few stretches of this trail, which is accessible from The Kanc and Bear Notch Road. The snow was well-packed so we bare-booted our way along this scenic trail. 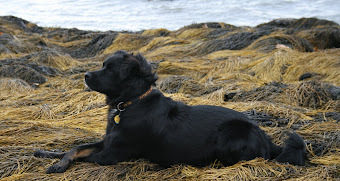 Taking the road less traveled on this weekend was perfect, allowing the dogs to run free and far and within sight and the space and time for us to stop to observe wildlife tracks and wander among an active forestry operation. We almost didn't notice that March arrived, as it still felt like deep winter. Trip Report: Mt Osceola and East Osceola, vernal edition. © 2013 Ellen Snyder. Simple theme. Powered by Blogger.